Today was day two of working on the Pond painting. If you compare it to yesterday's post you will see that I have added a lot more color to the sky. At this point I need to let the sky portion dry a couple of days before glazing and layering more color. I would like to layer a slightly lighter blue over the blue that you see now but I want some of that darker color to show through. What I can do tomorrow is work more on the water and trees. I want to decide early on where I am putting the heron taking flight and start painting the dock. Then I will wait until Monday to do more. In the meantime I will turn back to the painting of Jesse. 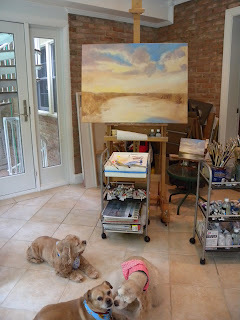 Today I started work on the 30 x40 inch version of Erik's Pond. You have been watching the development of this painting through the earlier posts of the studies for it. You can see the final study that I am working from on the little table easel placed next to the big one. 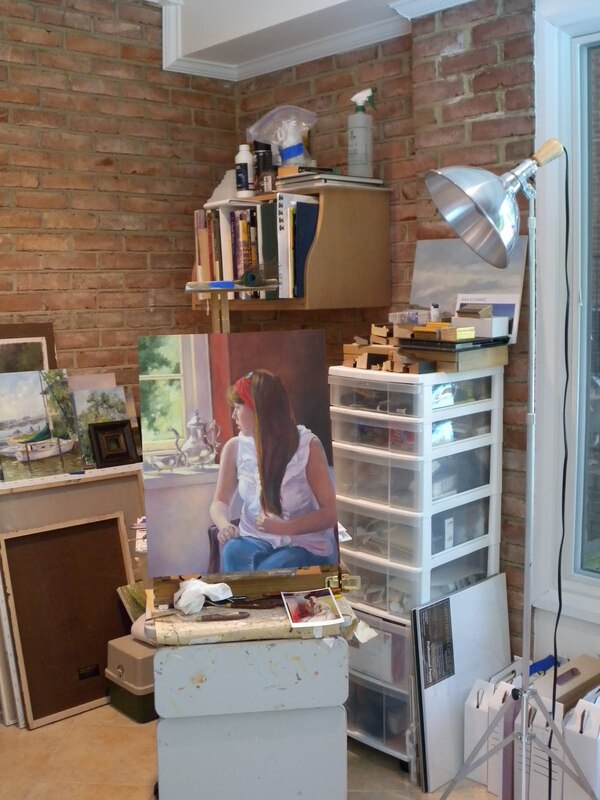 Rather than crop the photo I thought it might be more fun to introduce you to my studio and my constant studio companions. Over the years they have learned not to fall asleep behind me while I am painting because it could result in a painful experience. Poor little paws. The painting is starting off nicely and I actually got further than this today, however, I wanted to be sure to get a photo while the sun was shining. It was in and out today and this way you get to see it in good natural light, no photo shop. I ended up lowering the tree line/horizon line and making the perspective more dramatic. 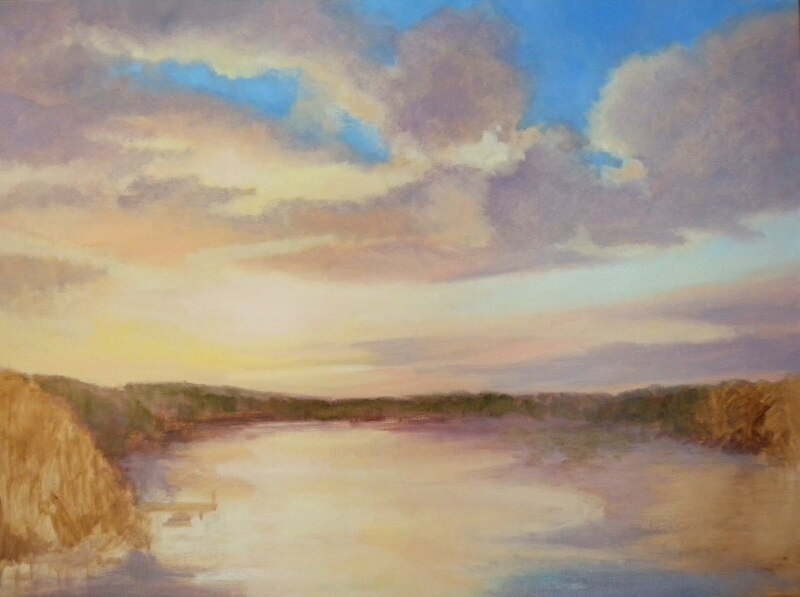 I also added some more color to the sky and water. I will be working both wet on wet and wet on dry in this painting and it will develop in layers. As I progress you may find some of the colors unusual in their placement when compared to the study but that is because I will be planning on them peeking through subsequent layers. 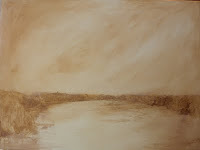 It helps to give depth and luminosity to the painting. ﻿ After Erik had some time to think about it he became concerned that study # 4 might be too dark against the dark stone that is floor to ceiling around the fireplace where the painting will hang. I have to say I see his point. Also he wanted the painting to be light enough for the viewer to be able to see some of the features important to him such as the dock on the lower left, the lily pads which are suggested here in the dark areas on the water and the white heron taking off from the pond, which this small format does not permit me to include. I very much appreciate him bringing these issues up now at the beginning so we can work together to create something that will bring him joy every time he walks in the room. As you can see from the photo below, which he kindly let me post, this is a very special location for my painting.I certainly want it to have the impact we both seek! In my last post I talked about all the colors I was using for the white blouse that Jesse is wearing in the painting. I mentioned that when finished it will be perceived as a white blouse. However, because of the way light works it is more natural to do this with all the colors I discussed rather than just using white from the tube. Here is another illustration of that but this time in the landscape. This is a detail of a large painting I did of the Great Falls in March, "Spring Rush". 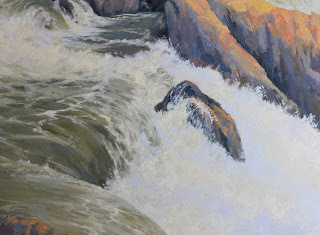 Rushing, foaming water as you see here or in the crashing waves of the ocean is full of color and movement and great fun to paint! 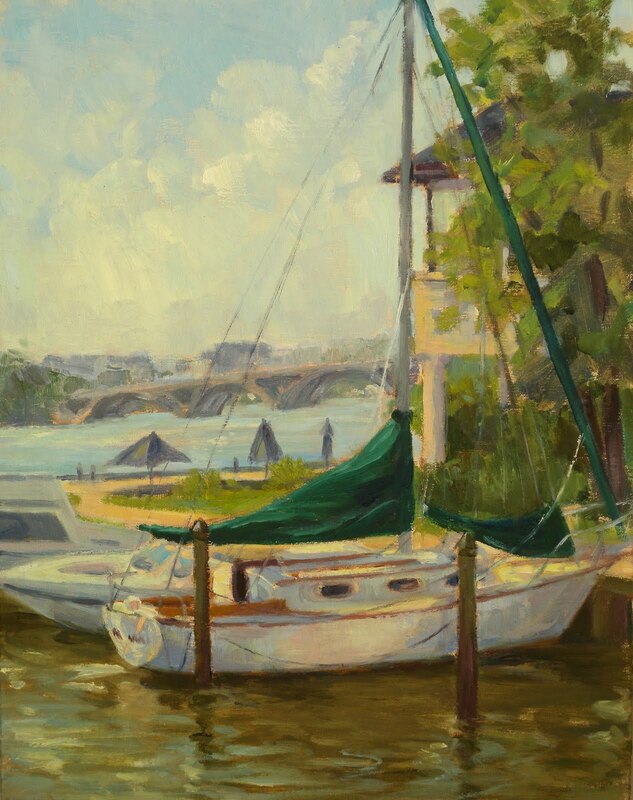 COMING UP: Plein Air paintout with the Washington Society of Landscape Painters this Sunday the 31st at Sugar Loaf Mountain in Maryland then back to the Torpedo Factory Dock for paintouts on Sunday August 7th and 14th. I haven't had a lot of time to paint in the last couple of days but I did get some work done on the Jesse painting. 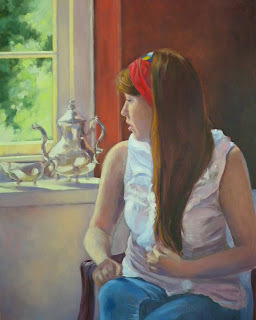 I concentrated on the lower half of the painting and also started to add color to her white blouse. If you are not a painter you might ask why color and not just use white and make the shadows gray. Light doesn't work that way. When finished you will perceive her blouse as white but except for perhaps the brightest hightlights pure white is not used at all. There is pale yellow, light blue and lavender and pink. Put a white cloth in the sunlight and squint at it and you will see what I mean. Using just white and perhaps some gray for the shadows would make the painting dull and chalky looking. 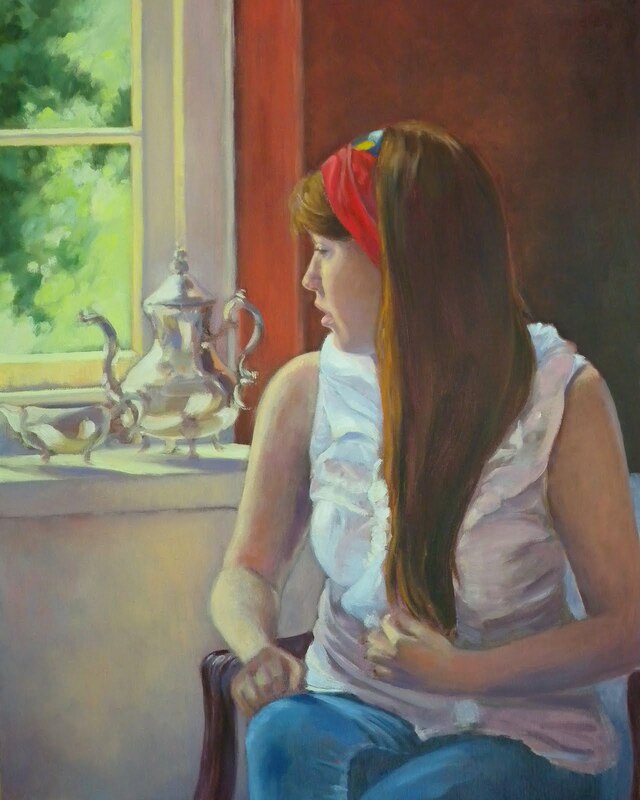 The shaded half of her blouse in this painting will also have to take into consideration the warm glow given off by the deep, reddish color of the wall. That is why the underpainting you see looks rather pink here. I was bothered by the strong highlight on the window molding that seemed to pop right out of the top of the tea pot in the earlier post. I have toned down the highlight with lavender as it hits the finial on the teapot and when the silver is more finished than it is now that will become an even smaller problem. During the next session I want to get to work on Jesse's arms and hands and improve the modeling and flesh tones. Before I finished for the day I added a small bluish highlight under her chin which is brought about by the reflection of her white blouse on her flesh. The accent serves to delineate her chin. Tomorrow perhaps more about the pond. 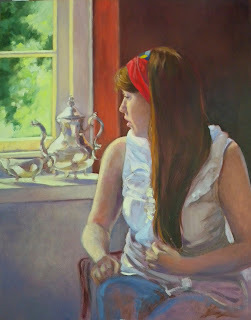 Today I continued work on the painting of Jesse building up the color and refining the light from the window. I had fun with the silver, the fabric and Jesse's hair. Her face is just about where I want it and at this stage I get nervous making adjustments to it. Tomorrow I need to concentrate more on the lower portion of the painting and bring it up to the level of the rest of the piece. While I am waiting for the underpainting for Erik's Pond to dry I turned my attention back to the painting of my granddaughter Jesse that is in progress. It is still pretty rough and you can see the lavender gray underpainting showing through and the forms are loosely sketched in oil. I have just begun refining and adding more color. It is entering the fun stage when I can start developing the light patterns more. Also, I find I love to paint silver so perhaps tomorrow I will work further on those pieces but I will have to resist the temptation to go too far with them before finishing work on the background and window. 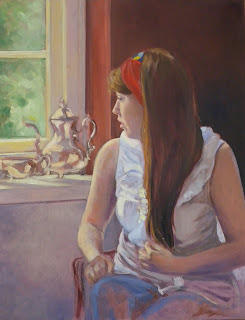 I don't do a lot of figurative work but I want to do more. In May I was involved in a project that I call Mark's Model Project in honor of Mark Ingraham who thought it up. 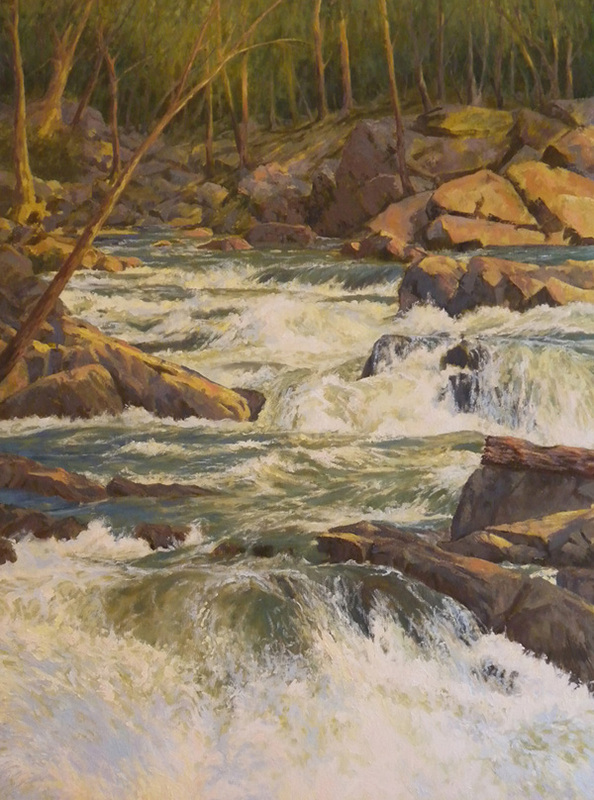 Mark is a wonderful painter and my sponsor for membership in the Washington Society of Landscape Painters, but that is another story. Anyway, Mark wanted to have a 2 hour photo shoot with a model using various changes of clothes, props and settings. Some contemporary some more romantic. I suggested my 20 year old granddaughter Jesse who would soon be home from college and I was able to procure the use of the living room in Old Main at the Madeira School for the shoot. 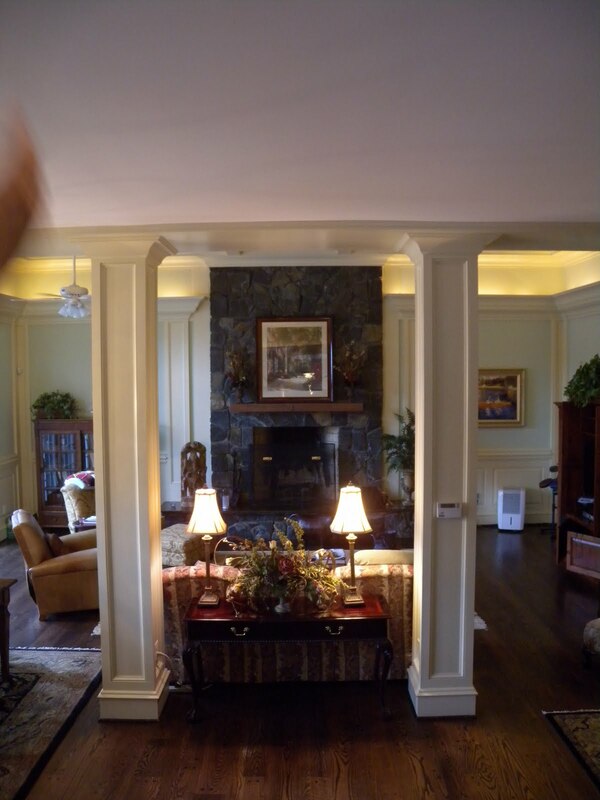 This is an amazing room with beautiful old furniture and huge french doors opening to a stone terrace which overlooks Mather Gorge on the Potomac. Perfect, and the weather that Sunday was gorgeous. Joining us were painters Barbara Nuss and Meg Walsh (also Washington Society of Landscape Painters) who along with Mark and me brought a lot of props and clothing for Jesse. Meg's stunning kimona was worth a painting of its own and Mark had a Chinese umbrella so I think you will be seeing that combo on Jesse sometime this year on this blog. We each took a different position so we captured Jesse from many different angles. Afterwards we burned our images onto discs that we gave to one another. We all now have a huge photo reference for gestures, lighting, furniture, the draping of fabric and the figure in the landscape as well as interior. Jesse was an amazing model and although she said she felt a little nervous in the beginning you would never know it. The hard part was deciding which pose to paint first. Lucky me, I also have Jesse home this summer and available to sit. 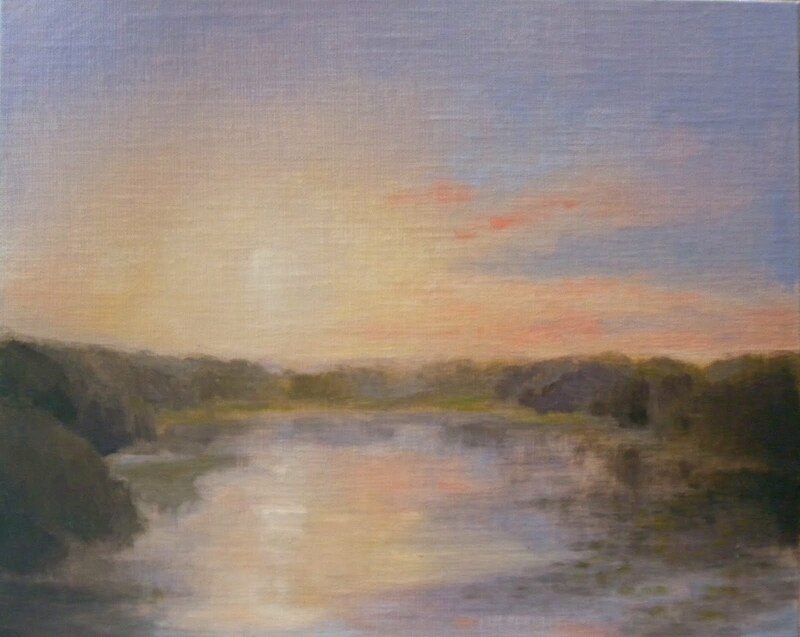 ﻿﻿﻿ Today I painted a fourth and probably the final study for a commissioned painting of a very beautiful eight acre pond in Great Falls Virginia. 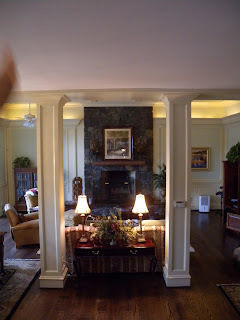 The pond is owned by Erik who has commissioned the painting for over the fireplace in his living room. He has requested a 30x40 inch oil on linen. 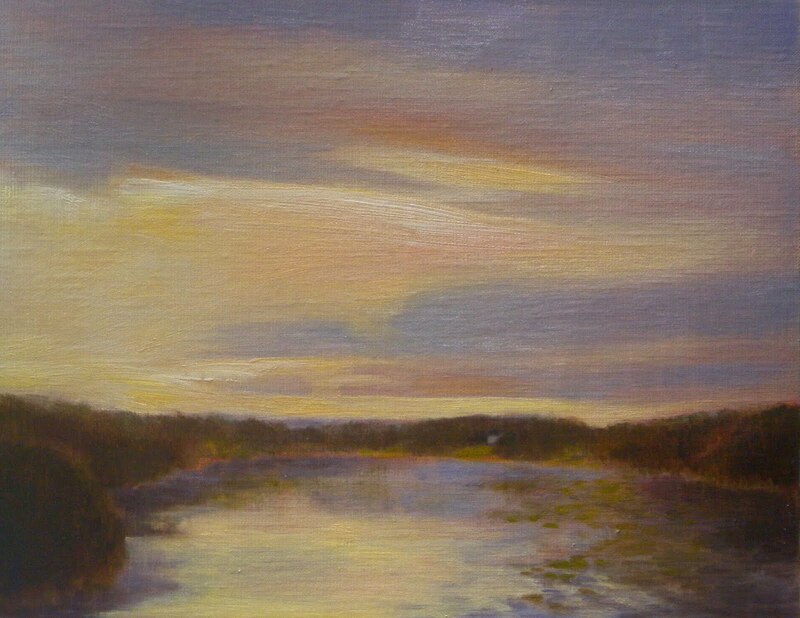 I am thrilled with the commission because the image of the pond at that time of day with the lighting and colors that are of interest to Erik are the very ones I most like to paint. 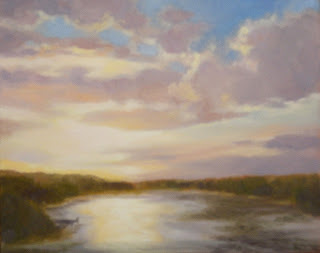 Last Sunday was the very first paint out of the Art League Plein Air painters. There were four of us, Jill Banks, Vicki Blum, Jack Dyer ﻿and me. We met on the dock behind the Torpedo Factory around 9:00 (Vicki wisely started earlier) and painted until noon. It was HOT! Thank goodness for my umbrella because the scene that interested me required I be in full sun and looking right into it. The brollie did its job and without it I would have fried. Lots of sunblock and water also helped. All this came about at the request of our director, Rose O'Donnell who asked if I would consider painting on the dock the first Sundays of July and August and did I think others would be interested. If so she would put a notice in Tidings and give my email address as the contact. There is plenty of interest but less for these hot summer Sundays than for later in the year. Then the light bulb went on! All I need do is collect names and email addresses and make sure everyone on the list has a copy of them. Any member can call for a paintout at any time by emailing everyone regarding where he/she wants to paint and ask if anyone will come. The initiator sets the time and place. Besides that there are two more paint outs scheduled for the dock on Sunday the 7th of August and on the 14th of August. The dock is loaded with interesting subjects and it is fun being there with musicians and interested people stopping to chat. There was a time I would have dreaded that but these days I rather enjoy it, especially if they ask questions. Sometimes that helps me decide where I am going with the painting. So, anyone interested email me at JKSland@cox.net. All that is required is that you be a member of the Art League. There is no jury, no meetings, no special dues. We welcome all levels and are completely inclusive. If it is your first time you can email me for a list of supplies you will need or just come on out and sketch, photograph or simply observe and see if it might be for you. Oh, and if the little painting I created doesn't sell beforehand you will be able to find it hanging on the wall of the Bin Gallery at the Art League Gallery in September. I hope you enjoy it! "Heading to the Falls" is heading to the Big Apple! I said that in this blog I would discuss the highs and lows in my life as a contemporary artist so I think it is auspicious that my very first post is about one of the highs. I enter a lot of juried shows and I get my share of rejection and acceptance notices. On the national scene more of the former than the latter so imagine my joy when I went to the mailbox and pulled out a fat, not skinny envelope from the Salmagundi Club. Remember those college acceptance/rejection notices and we always knew before we opened them what the verdict was based on the thickness of the envelope? The only question was which of the three I entered was accepted and I was particularly pleased that it was this one. 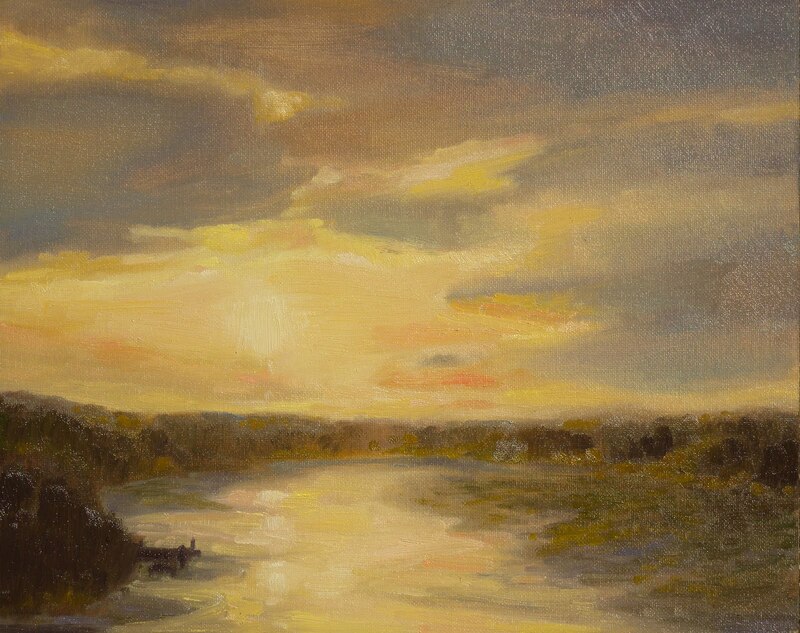 This is one of my favorite paintings and whenever I look at it not only do I remember the beauty of the place but also the sheer pleasure this one was to paint.